Diamondback Hook hard-trail is an incredibly efficient mountain bike, specially crafted for a fun and smooth riding experience for a variety of terrains. The climbing efficiency blended with a slack and aggressive geometry makes this model an even more impressive option for beginners. Below is a review that takes you through the features of Diamondback Hook in depth, while also throwing light on the pros and cons associated with this mountain shredder of a bicycle. More than a boon for riders, especially the beginners, this bicycle comes with a very sturdy, durable, reliable and truly light frame. That’s what makes the credit for the bike’s low-slung and slack built! The 6061-T6 butted aluminum alloy frame of the bike sports a 1/8″ head tube, along with a formed top and down tube. Integrated disc brake tabs of the frame offer progressive geometry and an internal dropper ready, making it excellent for smooth trail riding. Front suspension mechanism makes this bike capable of performing in different terrains, regardless of all obstacles, bumps, and rough trail features. SR Suntour XCM fork with 120mm of travel is the suspension mechanism for the hardtail bike, and it comes with 30mm stanchions, and a preload adjust coil spring. Riding through mountains and difficult trails call for alternate gear options to maintain a consistent speed in all types of terrains. The Diamondback Bicycles Hook comes with a full ISCG-05 chain guide, including roller front derailleur, SRAM X4 shifter, SRAM X3 rear derailleur, a KMC Z82 chain, and SRAM PG820 Cogset. Supporting 8-gear speed, it provides a super-smooth shifting. An overly effective wheelset offers amazing roll-over speed and riding stability. The bicycle comes with Kenda Nevegal lite tires, double wall rims, and 14g stainless steel spokes. The 27.5″x 2.35” wide set also provides incredible trail traction. To equip the braking system with maximum stopping power, the Diamondback Hook features Tektro Aires mechanical disc brakes that come with 160mm rotors both at the front and rear wheels. Additionally, Tektro 2 finger provides the linear brake levers with reach adjust, bringing the good beginner bikes to an immediate yet smooth halt when you need. A Ready Ride option saves so much time and effort that otherwise goes into assembling an affordable bike. Diamondback Hook is delivered 95% assembled. One only needs to work up the handlebar, front tire, and the seat. 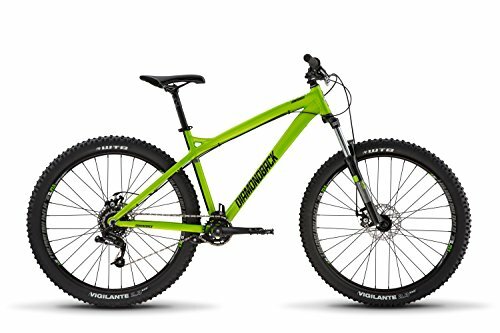 Taking a look at the aforesaid features and detailed Diamondback Hook review, it can rightly be concluded that the bike an awesome choice for a mountain rider, that too coming for an affordable deal. Not only is it reliable and light to ride, it absorbs shock, makes riding uphill easy with its several gears and comes with a squishy fork.